Use these resources to help your board understand the basic components of good governance and serve their organization and the public in the best possible manner. Please find below additional resources to help you learn more about advocacy and institutionalize it in your organization. 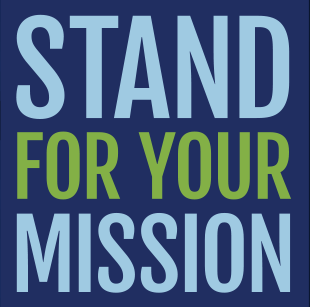 The Stand for Your Mission campaign is a challenge to all nonprofit decision-makers to stand up for the organizations they believe in by actively representing their organization’s mission and values, and creating public will for positive social change. Initiated by BoardSource — together with the Alliance for Justice, the Campion Foundation, the John S. and James L. Knight Foundation, the National Council of Nonprofits, and the United Philanthropy Forum — this campaign seeks to unleash the full potential of the nonprofit sector to create positive impact by engaging board leaders more directly in the advocacy work of their organizations. Campaign Vision: An active, engaged, nonprofit and philanthropic sector will result in greater mission impact, thriving communities, and a more vibrant country. We envision a reality where nonprofit and philanthropic missions are fully realized because community leaders hear our voices, understand our arguments, and see our causes as worthy of their best efforts. How do we get there? Advocacy. 20 million board members standing for the mission of their organizations and helping set priorities in partnership with government rather than waiting for the outcome.